Dry eye season is here! The Peak of Dry Eye Season Is Here. Eyes burning, watering, dry, blurry? Cold, low humidity, conditions during the winter time can lead to increasing amounts of dry eye. Furnaces and space heaters are running, heat vents in your car are blowing in your face. Staring at the computer lowers your blink rate and allows your tears to evaporate to the dry heat given off your computer. Walking outside the cold dry air blows across your eyes causing them to over water. Early on in the winter season, your eyes can withstand the dry conditions but often as the winter progresses, dry eye builds over time and patience often don’t become symptomatic until February or March so recently we have seen a big influx in dry eye diagnosis. Simplest treatment for dry eyes is to move to Florida where there’s more humidity. If that’s not practical, preservative free lubrication drops can be quite effective. Any bottle of eyedrops has a preservative in it as the bottle is meant to last for several months or even years. These preservatives can be toxic to the eye, cause inflammation and actually increase the overall amount of dry eye. They may feel good when you put them in but the preservative will cause them to be even more irritated over time. Preservative free lubrication drops are prepared in single use tubes which are much more friendly to the ocular surface and reduce inflammation while also giving dry eye relief. Retaine is our favorite brand which is available for sale at our clinic. 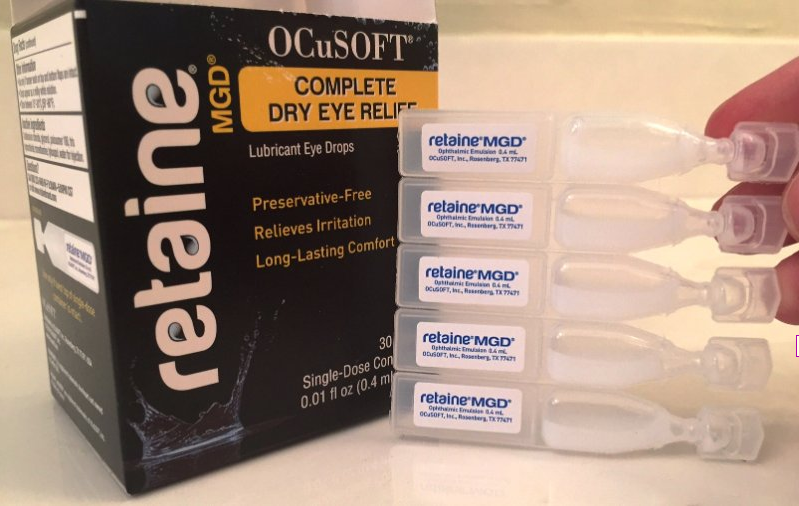 For maximum effectiveness, Retaine eyedrops should be used at least every morning and every night on a very regular basis during dry eye season. It’s far easier to prevent dry eye then to dig out of the dry eye hole which can take several weeks if the ocular surface is severely irritated. To prevent morning dryness, use a lubrication drops or even retain ointment before bed to ensure that your eyelid does not stick to your eye while you sleep which results in red irritated eyes in the morning. When is it time for Restasis or Xiidra for your dry eye symptoms? Please schedule an appointment today to be certain that no other more serious eye conditions are present. Why are my eyes watering? Epiphora or water night is a very common problem. Ironically, most watering eyes are due to underlying dryness of the ocular surface. Your eyes have two types of tears. The first type is secreted by glands inside of your eyelids which continually bathe the eyes to keep them lubricated. The second type of tears are your reflex tears which are stored in your lacrimal gland above the eye. These tears are reflexively secreted in volumes when you cry or get something in your eye. This reflex can also be triggered by an irritated ocular surface which is abnormally dry due to lack of your normal daily tears. So that is why wind blowing across your eyes, bright lights, staring at the computer, can cause your eyes to be watering. Lubrication drops such as retain can be very helpful in preventing this eye watering. Spring Trunk Show 50% off all frames and $300 off a complete second pair. Eyes Watering from the Winter Weather? The Burn and Sting of Dry Eye Season is early this year! Lumify Eye Whitening Eyedrops – Do they work? Copyright © Complete Family Eyecare, All Rights Reserved.